約在一個星期前, Apple 宣佈退出 EPEAT, 並表示將在列表上的所有合格產品, 包括通過 EPEAT 認證的產品, 會從 EPEAT 列表中刪除. Apple 是次的決定, 不但令大眾感到失望, 而且舊金山市政府亦同時宣佈將停止購買未通過 EPEAT 認證的 Apple 產品. 面對公眾的批評, Apple 今天宣佈承認錯誤, 並把所有合格產品放回 EPEAT 的綠色認證列表當中. Apple 表示, 公司的所有合格產品都將重返 EPEAT 綠色認證列表中. EPEAT 這個列表被視為行業標準, 可協助消費者選購合乎環境保護的電子產品; 一些市政府機關也會使用這個列表來指導購買電子產品的決定. 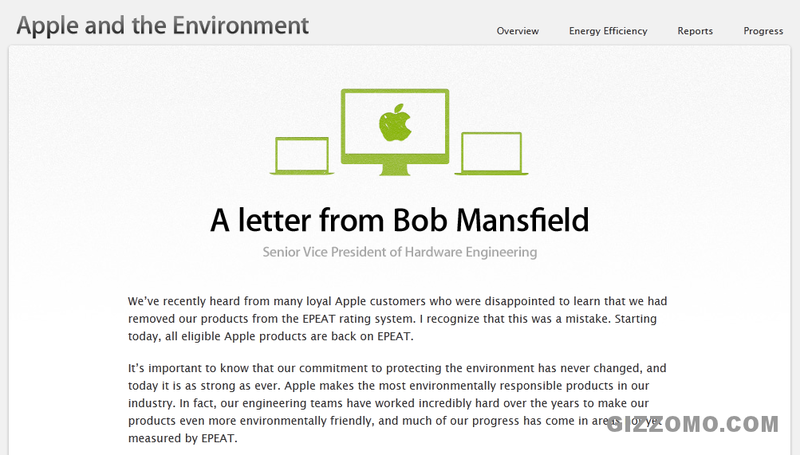 Apple 硬件工程高級副總裁 Bob Mansfield 在 Apple 網站上發佈公開信, 指出許多忠誠的 Apple 用家對於有關決定感到失望; 並在信中寫道: 「我意識到這是一個錯誤」. 這封公開信, 詳細解釋了是次 「回歸」 的理由, 並表示 Apple 對環保的承諾 「從未改變」. It’s important to know that our commitment to protecting the environment has never changed, and today it is as strong as ever. Apple makes the most environmentally responsible products in our industry. In fact, our engineering teams have worked incredibly hard over the years to make our products even more environmentally friendly, and much of our progress has come in areas not yet measured by EPEAT. For example, Apple led the industry in removing harmful toxins such as brominated flame retardants (BFRs) and polyvinyl chloride (PVC). We are the only company to comprehensively report greenhouse gas emissions for every product we make, taking into account the entire product lifecycle. And we’ve removed plastics wherever possible, in favor of materials that are more highly recyclable, more durable, more efficient and longer lasting. Perhaps most importantly, we make the most energy-efficient computers in the world and our entire product line exceeds the stringent ENERGY STAR 5.2 government standard. No one else in our industry can make that claim. We think the IEEE 1680.1 standard could be a much stronger force for protecting the environment if it were upgraded to include advancements like these. This standard, on which the EPEAT rating system is based, is an important measuring stick for our industry and its products. Our relationship with EPEAT has become stronger as a result of this experience, and we look forward to working with EPEAT as their rating system and the underlying IEEE 1680.1 standard evolve. Our team at Apple is dedicated to designing products that everyone can be proud to own and use.